That little donation turned out to be $100,000. 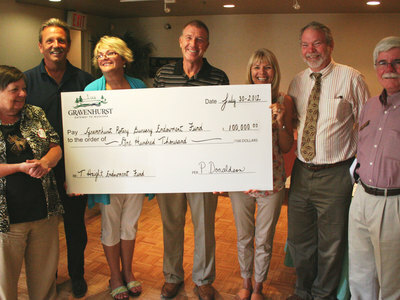 And Monday, she made it official with a cheque presentation at the club’s weekly luncheon meeting at the Opera House, where she received a standing ovation. She was accompanied by her daughter, Lynda Dyball, an artist and retired teacher from Washago. 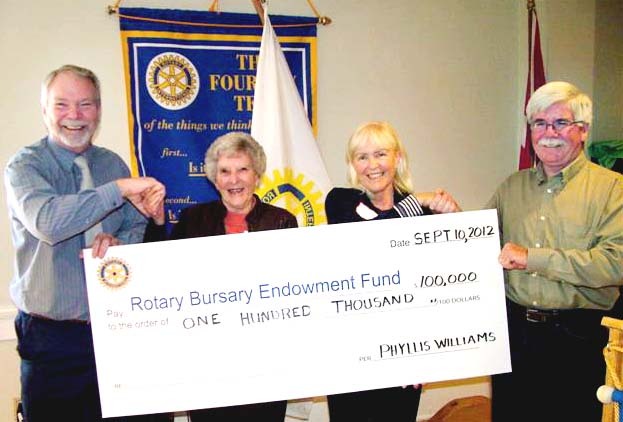 Williams and her late husband Glenn, who as a Gravenhurst board of education member and District Clerk for years, wanted to help young people pursue post secondary education. They have three children – Lynda, Barb and son Phil – who all grew up in Gravenhurst and who all benefited from further education. A scholarship in their name will be given out each year. 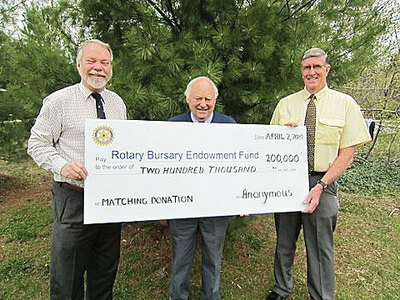 The donation brings the Rotary endowment fund up to more than $800,000 – through a matching grant this year of up to $200,000. This year the fund handed out $13,00o in scholarships from the interest to a dozen students. 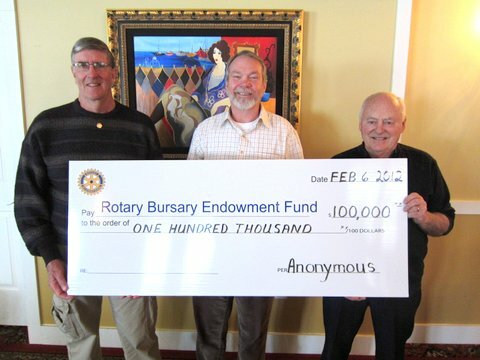 Recently, former Gravenhurst Rotarian Bill Rathbun also donated $10,000, which was matched by the anonymous donor. “Phyllis Williams, was born in 1916 ( I will let you do the math ) and grew up on the shores of Skeleton Bay on Lake Rosseau. She attended a one room school house in Bent River for 8 years. Her parents obviously valued a good education because at the age of only 13 Phyllis was sent to Bracebridge to go to High School. She boarded there because there were no school buses in 1929 and no way to get back and forth each day. In fact the roads in Town were not even plowed during the winter. A horse dragging a plow cleared only the sidewalks. Being boarded away from home at that age would certainly have built a strong character. You would certainly have developed a sense of independence, learned how to cope, developed close friendships and of course, concentrated on your studies. Phyllis graduated from Grade 13 and went on to Toronto to take a one year commercial course. One of her first jobs was at Canada Packers. She was hired after typing for 5 minutes without one mistake. Try that on a typewriter without a ‘backspace’. This is where she met her husband, Glen Williams. They married in 1942 and she joined him in PEI in 1943 before he went to Europe for the remainder of the war. In 1946 they spent the summer working in Windermere where someone recognized Glens attention to detail and accounting skills and asked if he would be interested in becoming the Town Clerk and Treasurer for the Town of Gravenhurst. He accepted. He also became the Secretary of the Light and Water Commission. At that time there were 3 towns, and 23 townships and although the mayors and reeves met once a year they had no power. Glen became secretary of the District Council and pushed for the District Municipality of Muskoka to be created. It was and he was the first clerk / administrator in 1970. He also joined with Bob Boyer to develop a ‘home for the aged’ which became known as ‘The Pines’ in Bracebridge. As you know……behind every successful man they say there is a strong woman and that was Phyllis. She not only had the secretarial and organizational skills to help him is his pursuits, but she managed the young family of three children. Lynda, who is here today, Phillip and Barbara. They lived in the wartime area of Gravenhurst. To get a Veteran’s Land Act lot you had to have a child and you had to be a veteran. The wartime area of Gravenhurst was a wonderful place to raise a family. There were lots of children to play. It was safe. There was a small parkette to play in and the schools were close by. There were 10 children in one family across the street from them. The families worked locally. They did not make a lot of money and the expectation of going to university was not a priority for most families. The opportunity to go to university was not available financially for these families. For Phyllis, there was more of an expectation for her children to go. Lynda went to the Ontario Art College and Phillip went to Ryerson to study engineering. 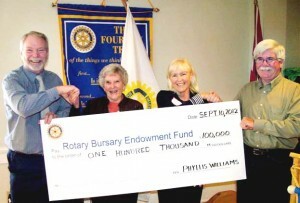 Phyllis has loved Gravenhurst and given back in many ways. When Glen was acting as Secretary of the Muskoka Steamship Society or singing with the ‘Men of Song’….. Phyllis was likely driving someone to hospital for dialysis treatments. Over the years Phyllis has seen many bright young children in our town who did not have the opportunity to go to university. She understands how she and Glen and her family have been blessed during their lives with good fortune, as a result of hard work and dedication.